According to Gould in Early American Woodenware, "the early name for the wooden plate was trencher and the man who ate from one was called a trencherman. Two people eating from the same trencher were called trencher mates and if a boy and girl ate together from the same trencher they were considered engaged." The plates made in this country were round and made of maple, ash, chestnut and cherry. While the custom of using the reverse side for a second course originated in England and must have clung to the generations here, the marks that we find on the reverse give credance to the story that there was a "dinner side and a pie side". 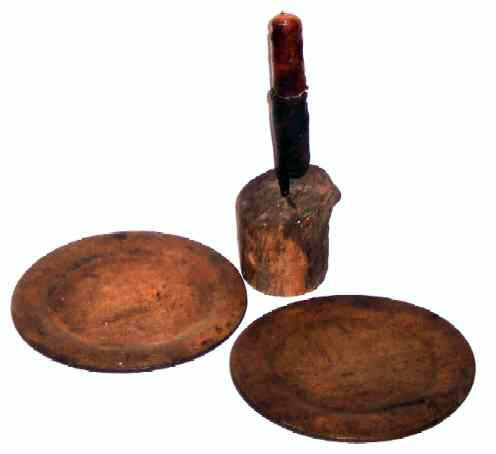 These round treen plates were turned on a lathe and the man who did this work was called a dish turner. Now, several hundred years later they are no longer completely round due to shrinkage against the grain. One plate is 7"- 7-1/2" in diameter and the other is slightly larger, being 7-1/2 - 7-1/3" in diameter. Both are in very fine condition, but do show the knife marks of usage as one should expect. While the use of treen plates gave way to pewter and ceramic plates by 1800, now they are eagerly sought after by collectors of early Americana. The form on these two plates would date them in the 18th century, resembling the shape of the pewter plates of that time.